When people try to bring you down, rise up and "Go High!" 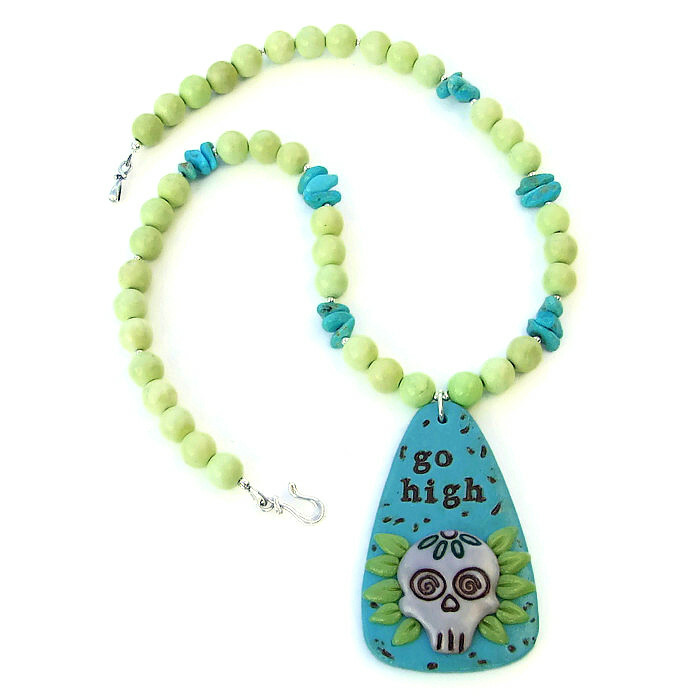 Whoever thought that fun and funky sugar skulls and an inspirational message could meld so well together to be the ultra uplifting focal of a necklace? They have united beautifully in the one of a kind GO HIGH necklace. 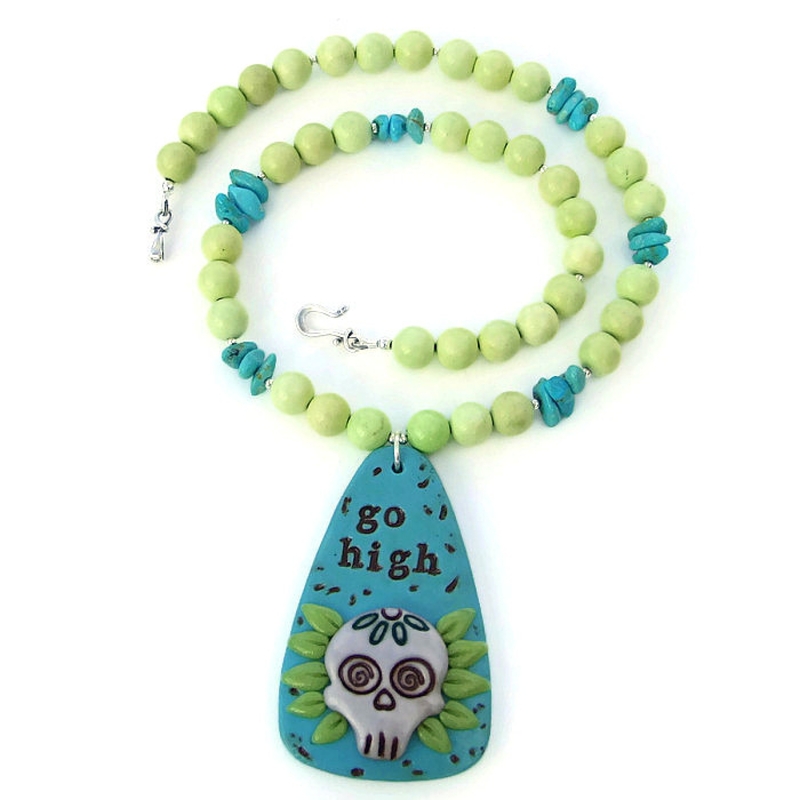 The unique necklace features an artisan fashioned polymer clay necklace with a whimsical sugar skull and “go high.” To perfectly complement the rich colors in the pendant, lemon jade (serpentine), genuine turquoise nuggets and sterling silver were used. 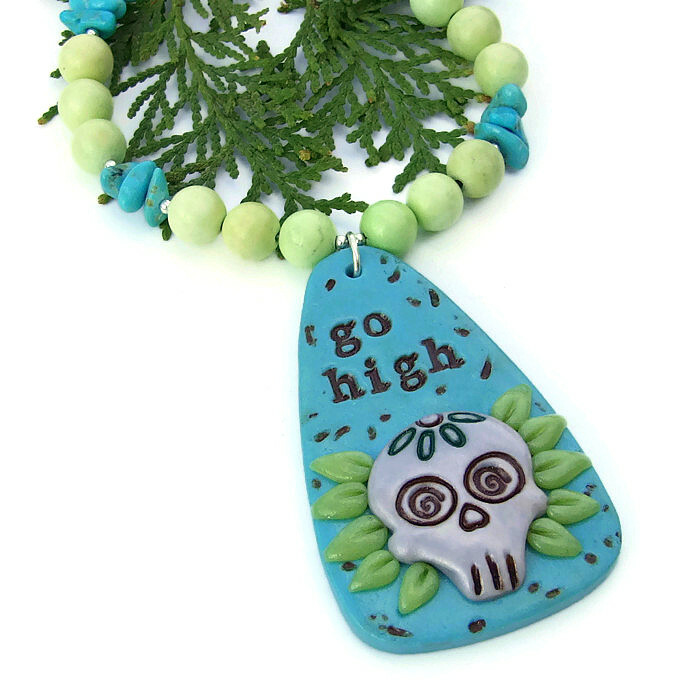 A unique handmade necklace to wear for Halloween or to Day the Dead festivities, it also can be used to make a meaningful, positive statement each and every time you wear it. 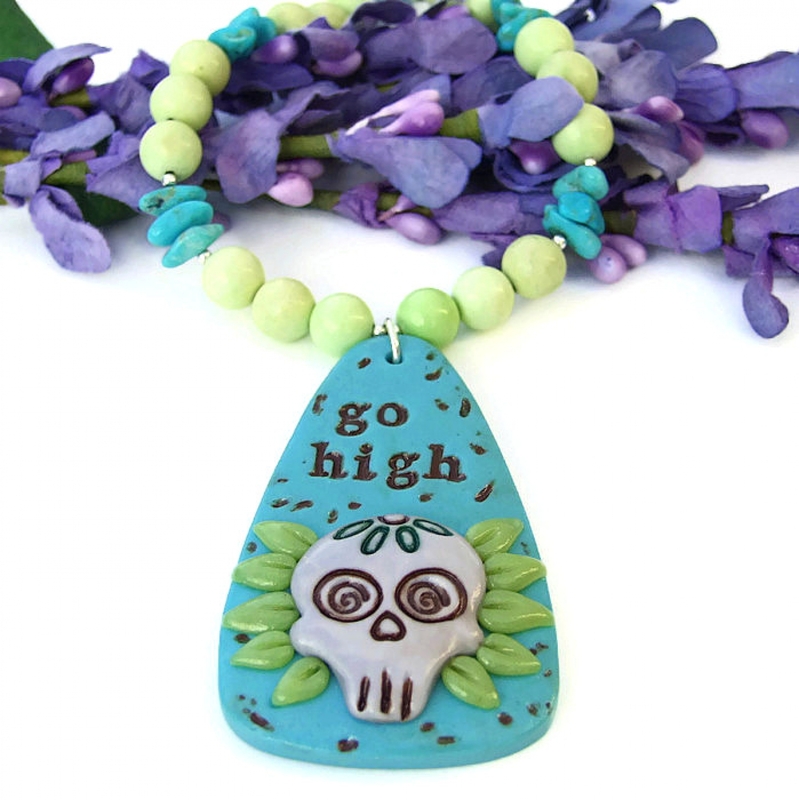 The GO HIGH necklace was carefully designed and handmade by Catherine of Shadow Dog Designs for the woman who adores artisan sugar skull jewelry and believes in staying positive. 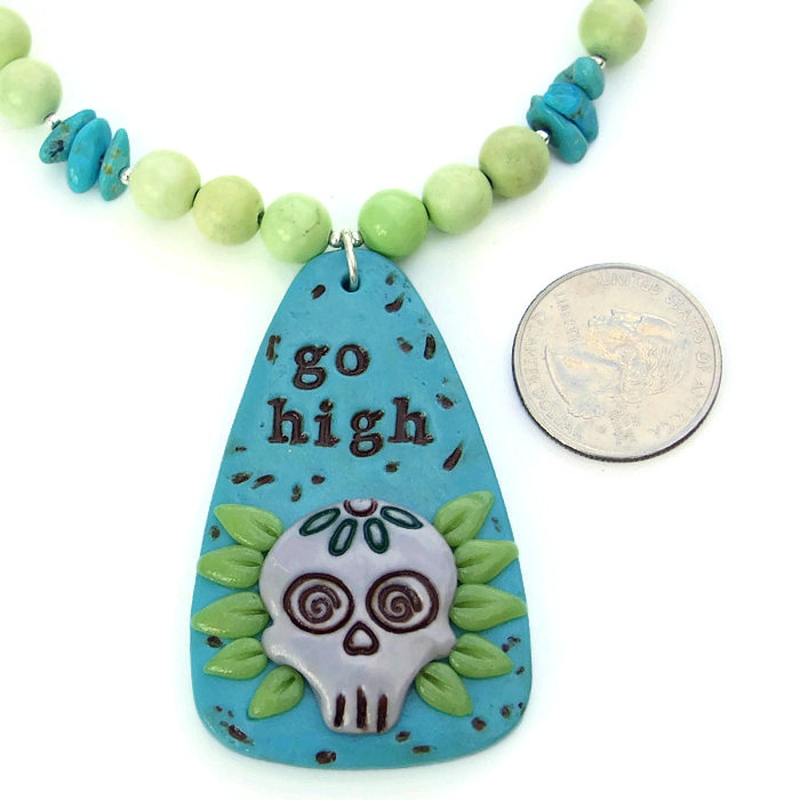 *** For a better understanding of the relative size of the sugar skull pendant, the lemon kade and the turquoise nuggets used in the GO HIGH necklace, please be sure to check out photo # 6 for a size comparison with a quarter. The awesome sugar skull pendant was created by Robin of robintheraven. 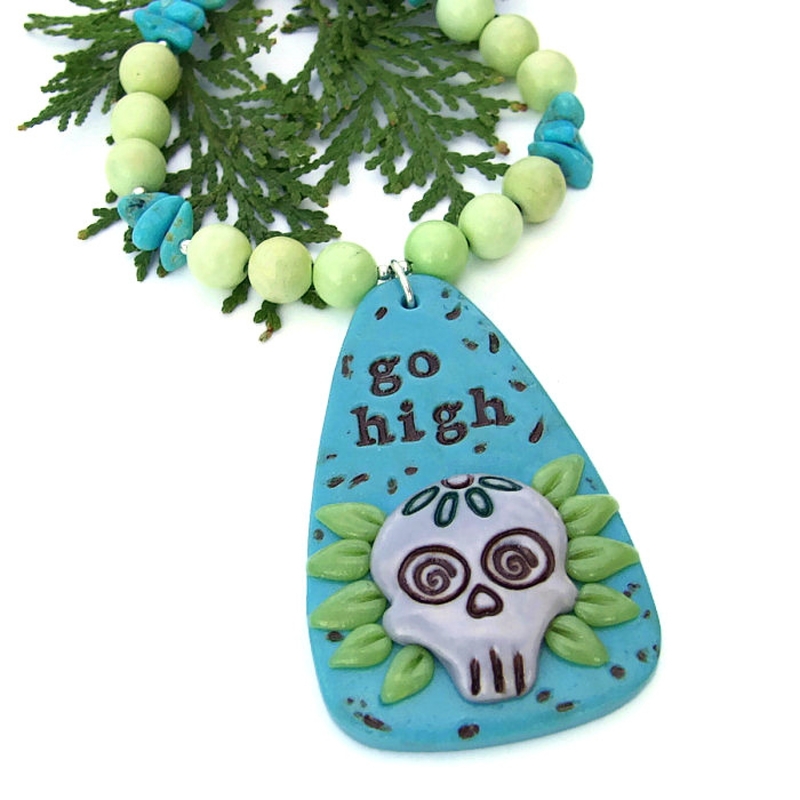 The pendant was formed with a base of turquoise colored polymer clay. Built on that are ten yellow flower petals and a finely detailed sugar skull that takes center stage. The sugar skull was formed from gray polymer clay and has spiraling brown eyes and a half flower of green and brown on his forehead. 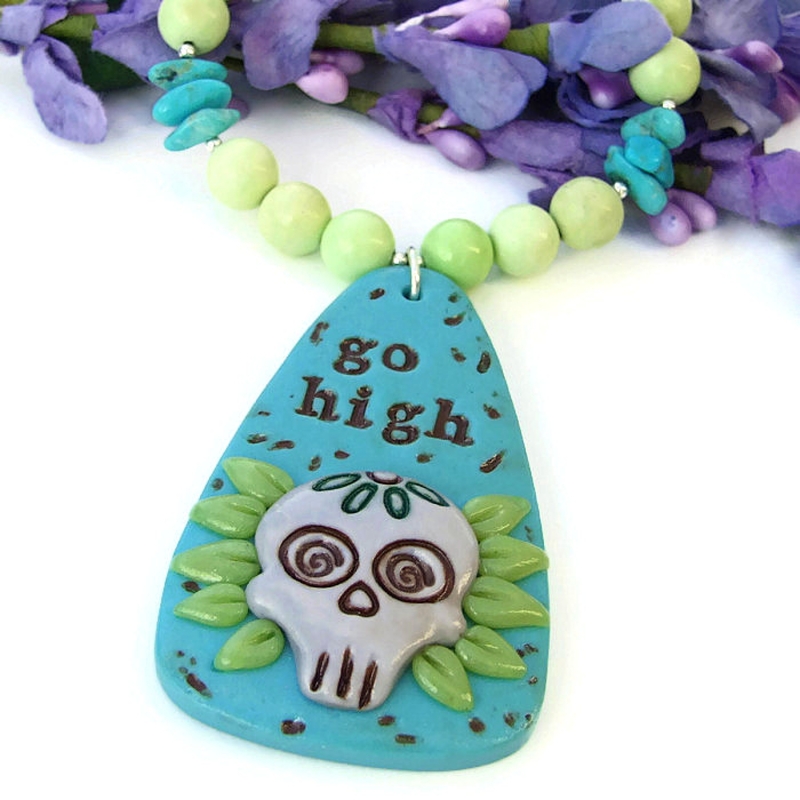 The words "go high" are stamped into the turquoise clay in a very dark brown. Surface antiquing and texturing add to the earthy feel of the pendant. It is connected to the main body of the necklace with a sturdy sterling silver jump ring. 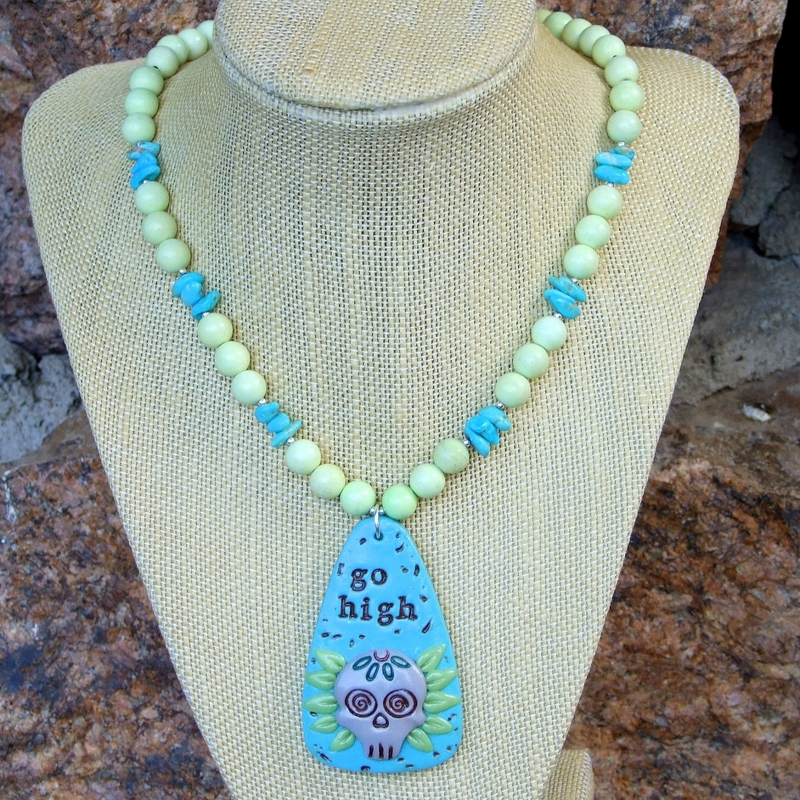 To perfectly complement the sugar skull pendant used in the GO HIGH necklace, two types of gemstones were used. The first is yellow jade (not a jade at all but a yellow form of serpentine) to bring out the color of the flower on the pendant and to add a sunny feel to the overall design. The round gemstones vary in color from a pale lime green to a soft yellow. They are in groups of three, except at the very back where there are five. Three sets of three turquoise nuggets in an eye popping sky blue were placed between the first groupings of yellow jade. The turquoise is genuine and is shot through with pale beige and tan matrix. Small sterling silver bead separate the turquoise from the yellow jade and add a soft glow. To finish the GO HIGH necklace, a lovely sterling silver hook and eye clasp set was used. The hook itself has a flowing line with a wrapped detail at the bottom . The eye clasp also has the same wrapped detailing, both adding a professional finish. Skulls are believed to ward off evil and ensure protection and well being. Lemon Jade (Serpentine) is believed to convey the gift of inner peace, joy and happiness and helps us understand the interconnectedness of all life. Turquoise is a stone of wholeness, promoting a sense of unity with all that surrounds us; it brings peace of mind, a soothing energy and healing of the spirit. Silver is a metal of love and healing; it is a mirror to the soul, helping us to see ourselves as others see us. The GO HIGH sugar skull pendant and gemstone necklace will come with two informational drop tags: one with the piece's name; the other lists the materials used in the necklace and the language of the stones and metals. It will be carefully packed in an organza jewelry bag, perfect for gift giving to a loved one . . . or to yourself!